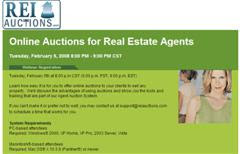 On Tuesday February 5th at 8:00 p.m. CST we are holding a Webinar for Real Estate Agents who are interested in learning about online auctions. There is no cost to attend. We will be discussing the advantages of using online auctions for your clients as well as introducing new tools and training that make it easier.